As we welcome another New Year, the race to deliver exceptional customer experiences is as competitive as ever. Customers are challenging brands to deliver value and convenience that’s tailored to their specific needs. Meanwhile, CX technology trends are expanding. Omnichannel services are evolving to include more options, smart speakers are gaining wider adoption, and self-service is being redefined. These are consequential times for executive leaders seeking to position their organizations to compete and thrive in a disruptive market. So, get ready as we outline the customer experience trends that are shaping customer service in 2019 and beyond. A few years ago, tying together various channels to create one unified customer experience was considered disruptive. Today, it’s a differentiator. Leading brands are offering unified omnichannel services that are tailored to customers’ specific needs and preferences. More specifically, omnichannel services include real-time customer data synchronization across channels. A banking customer, for example, could begin filling out an application online and complete it at a bank branch, over the phone, or another channel without starting from the beginning. The percentage of consumers who own three or more smart speakers rose to 30 percent in 2018 from 17 percent a year earlier, according to a survey by National Public Radio and Edison Research. As more people welcome voice assistants into their home and office, brands need to think about how they’ll connect with consumers in a way that’s authentic but not intrusive. Giving users the option of personalizing voice assistants —enabling the assistant to recommend in-network doctors or nearby clinics, for example—will transition assistants from being just a device to an integral tool in people’s lives. At the same time, the security of emerging voice assistants and active listening technologies are under increasing scrutiny. Demonstrating to customers that brands prioritize data privacy as part of the value delivered through voice interactions will be a critical differentiator in a rapidly growing market. In an increasingly IoT world, artificially intelligent devices are beginning to act on behalf of human customers. What happens when the customer is a machine? From cars and refrigerators to smart speakers, more and more devices are acting on behalf of humans. Google is allowing certain Pixel phones to make Duplex AI voice calls, such as to book a table at a restaurant. HP’s “Instant Ink” service automatically orders ink when it senses a shortage, and LG has created appliances that can communicate with each other. This is just the beginning of such customer service trends. In fact, 85 percent of consumers say they already use at least one of six devices or services (e.g. navigation apps, music streaming, virtual assistant) that feature artificial intelligence, according to a Gallup poll. From a business perspective, learning how to interact with devices that complete tasks on behalf of humans will redefine customer journeys and experiences. Sensors, cameras, and algorithms are altering customer interactions with human staff. More companies are using digital technology to automate tasks previously handled by humans and speed up transactions. In fact, drones could automate $127 billion worth of human labor and services across several industries over the next few years, according to PwC. Amazon has opened a handful of cashierless stores and is considering opening as many as 3,000 such stores by 2021, reports Bloomberg. Insurance companies are deploying drones for damage inspections and fraud monitoring. Expect more firms to incorporate AI-powered automation into interactions with customers. Quick CX wins are beneficial in the short-term but a quick-win culture is lethal. What’s more, quick wins like offering free snacks in a store or speeding up response rates online only go so far. To stay ahead of the competition, truly customer-centric organizations must commit to a long-term transformation. Corporate patience and support is essential in keeping customer experience initiatives on track for the on-going journey. Case in point: In 2018, only 13 percent of leaders described their organization as ‘truly customercentric’—down from 16 percent in 2014, according to a survey conducted by Janet LeBlanc + Associates and the Customer Strategist Journal. This suggests that leaders have a growing understanding of what it takes to be a truly customer-centric organization as initiatives mature. At maturing companies, CEOs are increasingly taking responsibility for CX strategy and digital initiatives. In past years, the chief information officer or chief digital officer typically led the charge on digital transformation initiatives. But as CX disruption becomes a top business priority, CEOs are increasingly taking the reins. And most CEOs that are focused on disrupting their businesses are intent on making cultural and structural changes. In fact, 42 percent of CEOs whose companies have a digital initiative underway indicated culture changes are necessary versus 37 percent of CEOs without a digital initiative, reported Gartner. The point is, focusing on technology alone—even when it is flawlessly designed—can obscure the other organizational steps necessary for delivering value. Ensuring employees have the necessary talent, knowledge, and mindset to drive transformation is key to building a disruptive business. A lack of available or appropriately-skilled personnel are one of the largest obstacles to digital transformation, according to industry reports. Some of the fastest growing roles are data scientists and advanced analytics analysts, with demand expected to spike 28% by 2020, estimates IBM. In light of the skills gap, expect to see more companies investing in reskilling or retraining programs as part of their customer experience strategy. Growing demand for ubiquitous customer support makes AI-powered assistance essential. Customers expect support services to be available anytime, anywhere, and from multiple channels. Indeed, 46% of global contact center decision makers project their contact centers will grow by 5% to 10% in the next year, according to Forrester. To keep up with demand, companies are doubling down on automation, AI, machine learning, and knowledge tools to help associates increase efficiencies, reduce costs, and improve the customer experience. 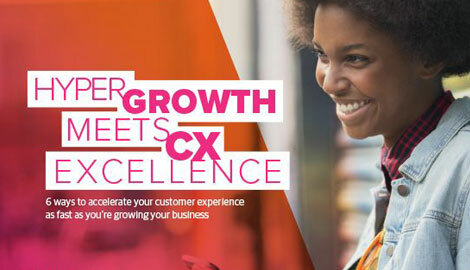 To learn more about disruptive customer experience and customer engagement trends, check out our e-book, CX Trends: The 2019 Edition.